Q. How is your injury? RAFAEL NADAL: I don't know yet. I have to check. I have to go to do an MRI. I don't know right now. I felt really bad during I felt that the half of the first set. With the 6 5, I felt terrible, no? I felt that I broked my foot at that moment. The point with the deuce, that point give me the set point, in that point I felt terrible, no? I asked for the trainer at that moment when the game was done. I seriously didn't know at that moment the match, I didn't know that if I will have the chance to continue playing. Q. Can you tell us how it happened or what happened? RAFAEL NADAL: I don't know before because I started to feel little bit pain there during the first set. I said before, half of the set. But with the 6 5, I pushed hard with the forehand defending shot and crossed. I felt something that like crushed there in the back of the foot outside. So I didn't know what was going on then. Q. Did the pain stay with you for the rest of the match? 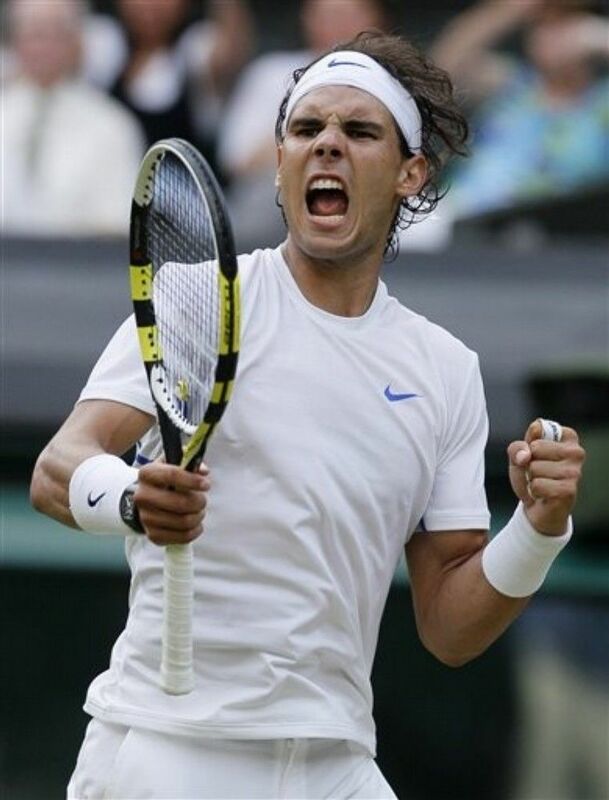 RAFAEL NADAL: The pain stay with me for the next points, for sure, and for all the match stays with me. But with the tape, I think we changed a little bit the direction of the support, and probably didn't hurt me much. But to run to my forehand was very, very tough for me. I felt pain because I cannot push with the foot to defend my forehand. To go against my backhand wasn't a problem. I can run fast there. I can run fast in front of me. The biggest problem is when I had to defend my forehand. Q. Is it the same injury you had in the last match? Q. How worried are you about Wednesday? RAFAEL NADAL: I am happy today I am through. I thought that I never gonna win this match when it happened with the 6 5. I am very happy to be through, winning against one of the best players of the world. I think was a fantastic match. Was a very good level of tennis tonight. And I'm worried, for sure. I'm going to do the MRI. We'll see what's going on. Tomorrow we will see. I cannot predict the future. Q. Will you have the scan tonight or tomorrow? RAFAEL NADAL: I don't know yet. I gonna check. I am checking with the doctors, with the physios. They are trying. We are trying our best to do it as fast as possible. Q. Was part of the problem that you couldn't take any more tablets because you were full of tablets for the previous injury? Q. Had you taken medication? Q. Before the match for your other injury? RAFAEL NADAL: I did, yeah. Q. And you couldn't take any more during the match? RAFAEL NADAL: I can, but with that pain I thought that's not gonna be the solution, so I didn't. Some question about the match? Q. Did you think the time violation warning was stupid? RAFAEL NADAL: I think is always the same umpire to do this. So I don't know if is stupid or not. But the match today was quick. Wasn't this kind of matches that you have slow between points, you have very, very long points, and you are tired and you rest a lot between points. Wasn't my feeling. I came here 100 times, and I said when the umpire give me time violation, I say, Well, if I was slow is my fault; it's not the fault of the umpire. I am the first one to recognize my faults when I do. Happened in Roland Garros I think few weeks ago. Somebody give me a time violation. I say, Okay, yes, that's true, I was slow. Was not my feeling today. Q. Right after Wimbledon there's the huge Davis Cup competition. Do you think it is a problem having Davis Cup right after a Grand Slam? And why won't you be playing? RAFAEL NADAL: The problem is the ITF, my opinion. They don't want to change nothing. They are never able to change nothing on the calendar, nothing in the format of the Davis Cup competition. And some thing they are doing bad, because the best player of the world, a lot of times we are not able to play. So that's happen, they have to think what's going on, no? But they don't think nothing. They keep winning his money and that's it. For me is hard not go to United States and play for my country. For somebody can think, Well, he only is think about himself. He is playing his own things. Doesn't matter about the Davis Cup. It's not my case. I always try to play Davis Cup. For me is a really bad new not to be in USA defending my country. I love defend my country. But, seriously, ITF is not helping us nothing on that, and for me is an obligation to not go there. I cannot be in every place. I cannot be competitive every week of the year. My body needs to rest. You know, I am here. Day before I had little bit pain here. Today I had pain on the foot. Few days ago the knee. So, you know, I played a lot of matches the last six months, especially last five months, four months. Is too much. Seriously, is not possible be No. 1 or No. 2 playing Davis Cup every tie, be in all the places, be competitive in all the tournaments. Is not possible. I am not 18 anymore. I am 25. I am playing a lot of matches. I am lucky because I won a lot of matches, so for that reason I am playing that match, not because I am playing more tournaments than usual. So for that reason I cannot be there. For me is tough. But for the ITF, doesn't matter. Q. Juan Martin for the first time this year he was in the second week in Wimbledon. Some people said his grass court game wasn't very good. You really understood what a threat he was. Can you describe his game? RAFAEL NADAL: Always is the same history. The same was with me two years ago when I lost in 2005 in second round against Muller. My game is not ready for grass. After four years I played two finals, two champions. Here I am in quarterfinals. He is young. He has an unbelievable potential. With this serve, he is always very competitive in these courts. And for sure the No. 4, 5 of the world winning Grand Slam titles, he's one of the favorites to win here. Why not? He has very good serve, very good shots from the baseline, and his volley looks good. I don't see no one reason to think he not gonna play really well here.